Read the chapbook version online! Aby Kaupang is the author of NOS, disorder not otherwise specified (w. Matthew Cooperman, Futurepoem, 2018), Disorder 299.00 , Little “g” God Grows Tired of Me, Absence is Such a Transparent House, and Scenic Fences | Houses Innumerable. She holds master’s degrees in both Creative Writing and Occupational Therapy and lives in Fort Collins where she served as the Poet Laureate from 2015-2017. 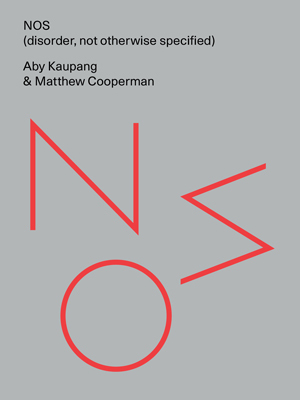 Matthew Cooperman is the author of NOS, disorder not otherwise specified (w. Aby Kaupang, Futurepoem, 2018), Disorder 299.00, Spool, Imago for the Fallen World, and several others. He is a professor at Colorado State University. More information can be found here.